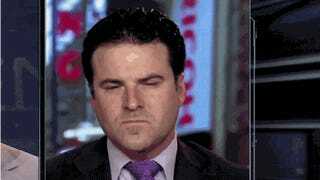 Darren Rovell—a living, breathing blazer from Northwestern’s business school—is fond of tweeting out pictures. Sometimes, it’s a cake that’s shaped like a shoe, and usually it’s a piece of truly fucked up junk food from a stadium. Tonight, he posted a very well-composed picture of the Chicago White Sox’s stadium, and the Chicago skyline off in the distance. MLB’s Cut4 account quickly pointed out that the White Sox don’t play tonight. On its own, this would not have been a blogworthy transgression. Rovell never explicitly said that the picture was from tonight, but he deleted his tweet, so here we find ourselves. ESPN&apos;s Darren Rovell On Nike Exploiting Chinese Workers: "It Is What It Is"
What Is The Bleakest Thing?